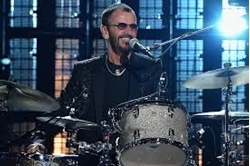 Beatles History: Ringo Starr's 10 Greatest Recorded Moments. Beatles Radio: The Beatles, Solos, Covers, Birthdays, News The Fab 4 and More! The following gallery of Ringo Starr's 10 Most Historic Moments recognizes a career that took a while to gain the respect it always deserved. Starr seldom sang with the Beatles – just 11 songs total – and, with only two songwriting credits, he didn't pen much either. But that's hardly the sum of his value within the band's larger musical framework. Instead, it's the way Starr drove others' musical conceptions, completing the Beatles' songs in a way as unusual (he's a left-handed drummer who plays a right-handed kit) as it was underrated. Just listen to Starr's smart eruptions on "She Loves You," "Ticket to Ride" and "Rain," the innovative fills that punctuate "A Day in the Life," the off-beat aggression of "Tomorrow Never Knows" and "Helter Skelter," the lithe jazz asides on "I Want You (She's So Heavy)." The other Beatles knew it, even if too few outside of their circle did at the time. Even Paul McCartney has noted that Ringo's arrival "was the beginning, really, of the Beatles."